I’m at that point now where I’ve sort of lost track of how many weeks I am, but I am 33 weeks pregnant on Sunday, which hardly seems possible. In theory I could have a baby in 4 weeks!!! I’m still thinking this one will be early as I’m having contractions every day. They seem a bit stronger than braxton hicks, but come and go, so I’m not too worried yet. I’m feeling fine though, not too uncomfortable and not too tired. I think my daily doses of Spatone have helped keep my iron levels up and my blood pressure is on the low side, which I’m seeing as a good thing as I don’t want it to get high. People keep telling me how huge I suddenly look, which in some ways is reassuring as there were concerns in the beginning about growth problems later in pregnancy, but so far everything is looking great, fingers crossed my low levels of PAPP-A won’t cause either of us any issues. Apparently a baby weighs about 4 pounds at 33 weeks, the thought of that weight doubling over the next 7 weeks or so is a bit scary as my stomach clearly will have to expand a bit more yet! I had my whooping cough vaccine last week. This is something new since my last pregnancy and is to protect the baby from whooping cough in the first 8 weeks before he has his own vaccines. 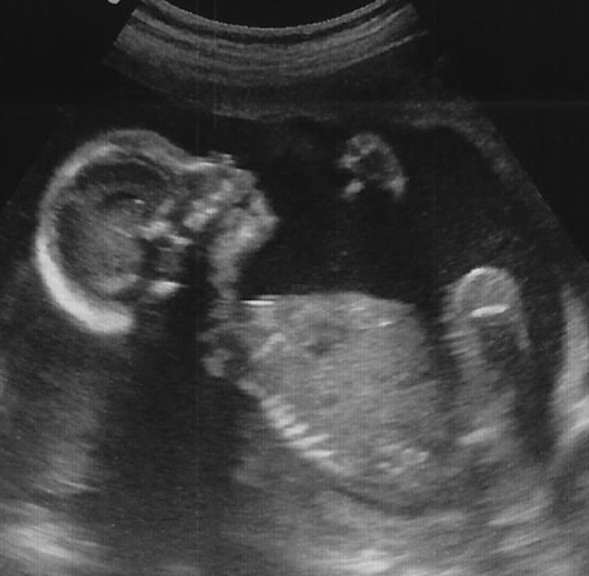 I have a scan booked for the beginning of March and still have my fingers crossed for a home birth. I am getting a bit impatient now though, this pregnancy has gone by so quickly, but the end of March still seems like a long time away, even though I know it’s not and I have plenty to keep me busy. We STILL haven’t made any progress with the nursery or buying a pram, car seat or cot. I really want to clear out his room and paint it before buying anything. I just need a spare week to get the painting done and with half term looming, that’s not going to happen soon. I really must start to get organised. I haven’t even thought about baby monitors and breast pumps yet either! Were you less organised after baby number one? So much less organised! But it all feels such a long time ago now that my two are 6 and 9. Can’t quite believe it. Wow – how exciting, you will have your hands full! I think you are more relaxed about stuff after baby number 1. I remember not being as organised in that I didn’t have hospital bags packed and things like that, like I did first time round, but because I was more confident, I knew it would all work itself out in the end. Good luck with the birth, you’ll probably get a nesting boost now to get those last minute purchases made!! Cass Bailey recently posted..How to save BIG MONEY on your existing mortgage…. Kara recently posted..Puppy Surprise – Taffy!! Pregnancy is the hardest and the happiest because we have a new member in our family. I will welcome a new baby in July this year. I am looking forward to seeing her.